Playing this championship course demands full concentration. 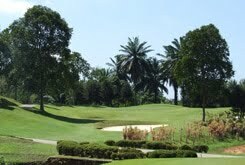 The Cempaka measures 7,156 yards from the pro tees, which requires skill in assessment and execution. More intimidating is the number of severe doglegs, narrow fairways, 9 holes of water and more than 60 sand bunkers together with the winding Serangoon fairways that would daunt any seasoned golfer. The wide expanse of undulating Bermuda greens, however, would provide an advantage to experienced green readers.